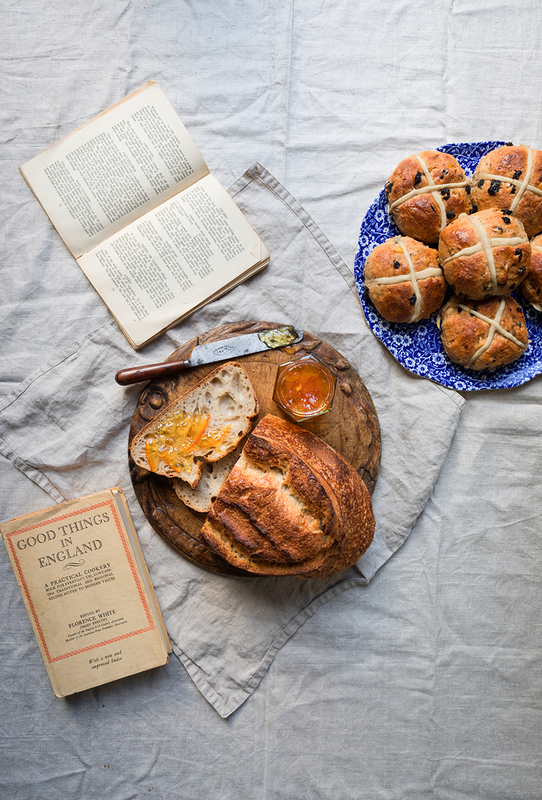 The first recorded reference to ‘hot’ cross buns was in ‘Poor Robin’s Almanac’ in the early 1700s. This recipe is a revised version from one that appeared years ago on this site. I advise to use this one. **Optional: I like to add 100 grams of finely grated carrot (weighing the carrot before grating) which I think is a nice addition to the bun without taking away too much from its traditional character. Warm the milk to body heat and chop in the butter to melt, stir. In a large bowl, combine the flour, yeast, sugar and spices. Make a well in the middle and pour in half of the milk & butter mixture and the egg, knead (using a mixer with the medium speed, dough hook attached) for a short while, then add the rest of the milk until everything is combined and you don’t see any dry flour left. Leave to rest for a few minutes* for the gluten to develop then sprinkle over the salt and knead for 5 minutes on medium with a mixer and 10 minutes by hand, then leave to rest for a few minutes again. When the dough has rested add the dried fruits and candied peels and use your hands to work them into the dough or use your mixer on a very low speed. Place the dough in a large bowl or leave in the bowl of the mixer and cover it, I re-use those plastic shower caps you get in hotels. Leave to prove for one to two hours, until doubled in size. In the meantime prepare a large shallow baking tin by lining it with baking paper. This is also a good time to prepare the mixture for the cross topping. Combine the flour and the water and add to a piping bag. After resting, divide the dough into 12 even pieces and gently shape into balls. Place these balls evenly spaced on the baking paper and leave to rest in a warm place for another 30 minutes to one hour (until about doubled in size) covered with a clean damp cloth or plastic bag. 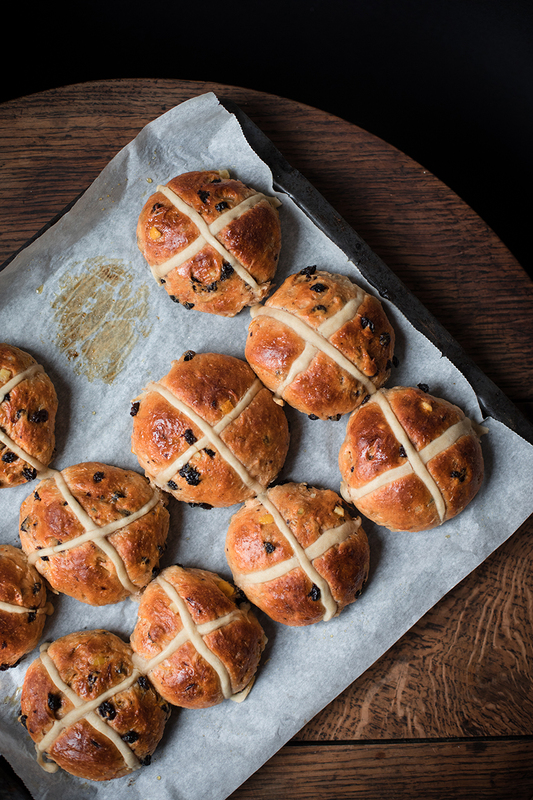 Preheat your oven to 210° C.
The buns should be doubled in size by now – carefully pipe the cross to each bun by using the piping bag and the mixture you prepared. Bake the buns in the middle of the oven for 20-30 minutes until they are golden brown. Prepare the shiny glaze by heating up 2 tbsp of water with the sugar or heating up the golden syrup with a teaspoon of water. Remove the buns from the oven; brush them with the glaze to give them that lovely shiny finish. The day after they can easily be heated in a hot oven for a few minutes, or 10 seconds in a microwave. *Letting the dough rest for a while without salt is called an “autolyse”. It allows for enzymes to do part of the gluten development before you start to actually knead it. Adding salt with the yeast can kill it or slow down the process. This way it forms a developed dough more quickly. What a delight this and all you newsletters are! Thank you so much. Memories of childhood in the 1940s in Christchurch, New Zealand come flooding back. My English parents produced some or similar things to what you give us. My father was a baker and pastry-cook, and an expert at tiered wedding cakes. He was from Yorkshire, and mother from London. Regula, you should be recognized as a national treasure, as the Japanese do with their outstanding cultural enhancement people. All best wishes for your continued success and kind regards from Laurence Bingham. Wow Lauren, you are the kindest soul!! You must have learned so much from your father! How inspiring! Happy Easter! I hope you will love them this time! Happy Easter! I am looking forward to baking these tomorrow. I was reading over the recipe and I didn’t see a baking time. How long should these bake in the oven? Hi Erin, you beat me to it, I somehow deleted the baking time and it has been added again now! Happy baking! !